The UK is Kia’s largest market place in Europe & as sales of the Korean brand have grown, so too has it’s model range. 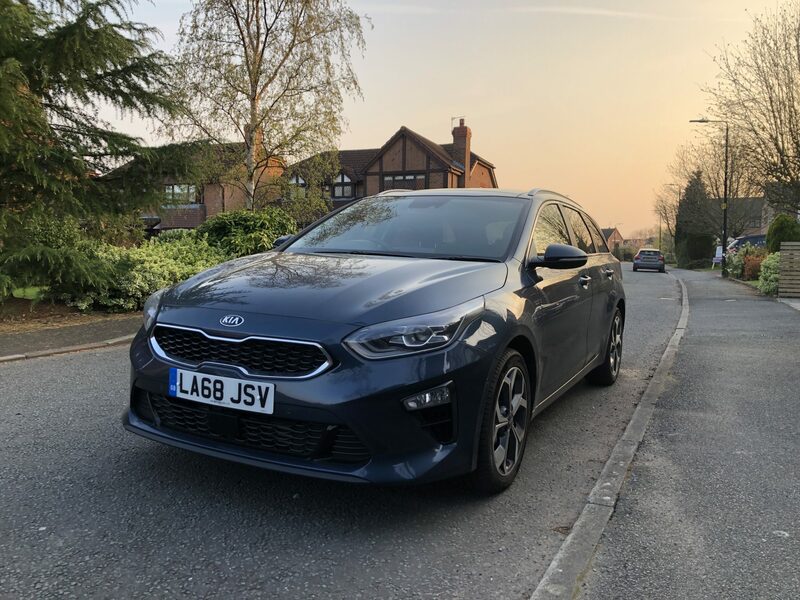 Kia launched a new Ceed in 2018 & hot on it’s heels have also launched a Sportwagon ‘estate’ version, that features much of what you’ll find in the five door hatch. I was surprised to read that 40% of Ceed’s sold in the UK historically were estate versions, so this new SW is an important car for Kia. The SW share’s the same front end as the hatch, which features the tiger nose grille & ice cube LED lights. There’s standard fit roof-rails & fake plastic vents behind the rear wheels to disguise the extra length. At the back, there are LED lights & a body-coloured spoiler on top of the tailgate. There are three models in the Ceed SW range, with all coming well equipped. Sportswagon ‘2’ is up first & it offers 16″ alloys, air-con,a 7″ touchscreen with smartphone compatibility, voice control, a 6-speaker sound system, reversing camera, cruise control & autonomous city braking. Then it’s the Sportwagon ‘3’ with larger 17″ alloys, dual zone air-con, an 8″ touchscreen with SatNav, DAB, privacy glass, rain-sensing wipers & rear parking sensors. Finally, there’s a Sportwagon ‘First Edition’ which were testing, which comes with the addition of a sunroof, LED headlamps, a JBL premium sound system with 8 speakers, smart parking assistance, cruise control, heated & ventilated front seats, a heated steering wheel & an electronic parking brake. Engine options are a 1.0-litre T-GDi petrol three-cylinder, a 1.4 T-GDi and a 1.6 CRDi diesel, with our test car being the 1.4 petrol T-GDi version. 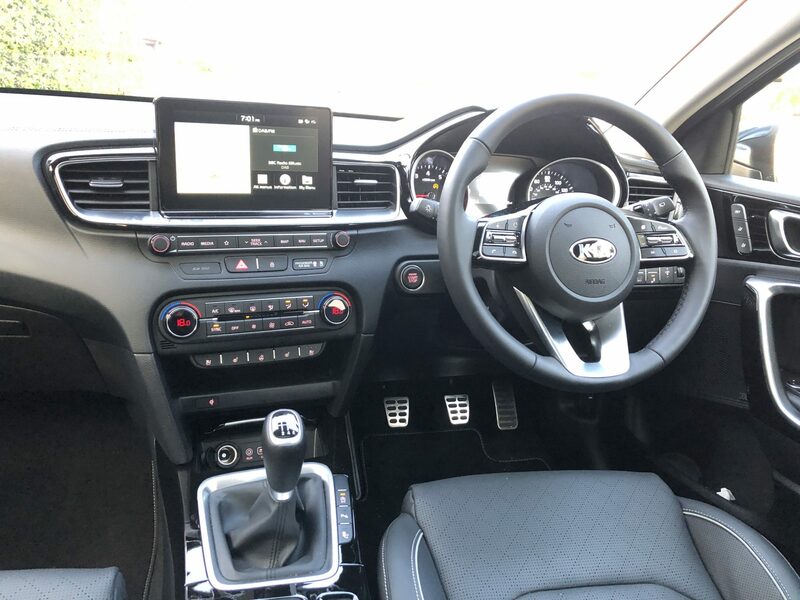 The Ceed SW’s interior will be familiar to anyone who already has a Kia our a Hyundai. The quality is good, but not quite as the inside of a Golf or latest Ford Focus. There’s soft touch plastics on the top of the dash & the First Edition also features grey part leather seats, a leather trimmed steering wheel & gear stick. Lower down there’s some cheaper looking harder plastics on the centre console & door pockets, which is a surprise. The infotainment system though is first class. 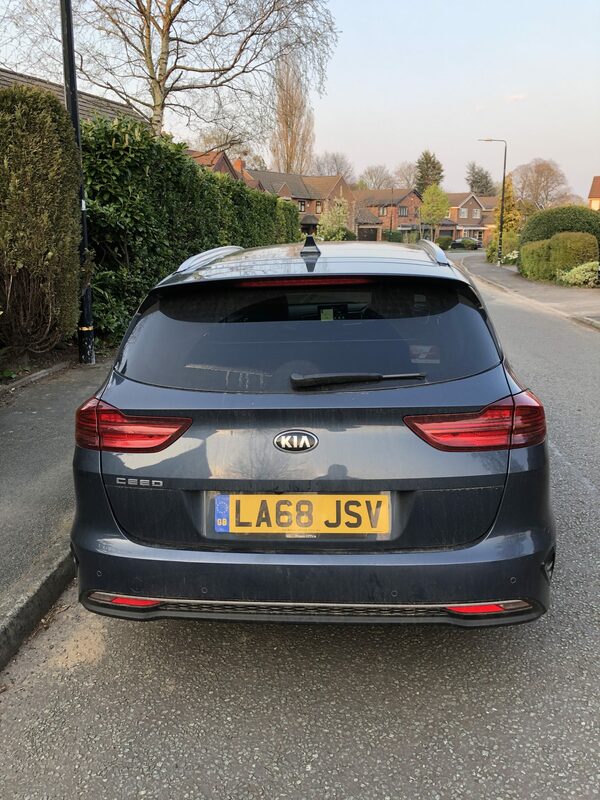 First Edition offers an 8 speaker JBL premium sound system, USB & aux in sockets, Android Auto & Apple Car Play with voice control, a wireless mobile phone charger, 8″ touchscreen SatNav, a reversing camera, DAB, Bluetooth, plus smart park assist. It’s all tidily packaged & the dash-top infotainment screen is one of the easiest to use in any car out there. The 1.4-litre petrol engine is actually pretty good. There’s 138bhp on tap, with a 0-60 mph time of 8.8 seconds & a top speed of 130mph. 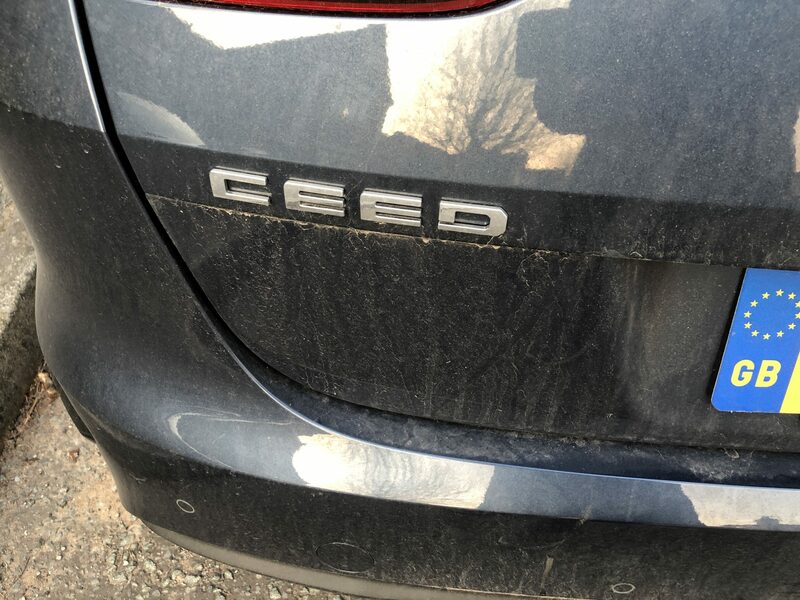 You can drive the Ceed with confidence & as we found, it handles winding roads in it’s sleep. Steer quickly into a bend & the Ceed comes out of it incredibly well. The ride though is on the firm side & there’s a bit of shuddering over pot holed roads, which was not helped by the 17″ alloys fitted to our test model. Smaller 16″ wheels would probably be better. A couple of 80 mile motorway drives, demonstrated that the SW is a good motorway companion. The cabin is quiet, with outside noise kept to a minimum, although the large boot means it is nosier than the hatchback. Driving on the motorway we selected cruise control & the punchy petrol engine allowed us to overtake safely when required. Overall, piloting the new Ceed SW was enjoyable & it drives just as well as the Ceed hatch too. The most economical petrol engine on offer is the 1.0-litre, which offers a combined fuel economy of 54.3mpg. The 1.4-litre petrol we drove returns up to 48.7mpg in manual mode, with the 1.6-litre diesel a much more attractive 68.9mpg. CO2 emissions are 120g/km for the smallest petrol, 106g/km for the diesel, with the 1.4 petrol version offering 132g/km of CO2’s. We drove the SW for a week & 290 miles, on a mix of roads, in mostly fine weather & mainly with just the driver on board & returned a disappointing 37.8mpg. Indeed the tank needed topping up after about 260 miles when the warning light came on., which is typical of 450 litre petrol cars as a whole. Whilst the diesel is not a popular choice, at least amongst those Department of Transport movers & shakers, undoubtedly if you drive in excess of 10,000 miles per annum, the diesel version will save you money at the pumps & emits a lower amount of CO2 than either petrol versions. BIK across the range is almost identical whichever model you pick, with the 1.4 petrol 27%, 1.6 diesel 26% & 1.0 litre petrol 24%. Our 1.4 petrol First Edition, thanks to it’s extra kit, retails at £27,805, whilst the closest specced diesel to this, is the 1.6 CRDi ‘3’ manual Premium, which would set you back £24,080. Why choose the SW over the hatch ? Well it’s space of course. 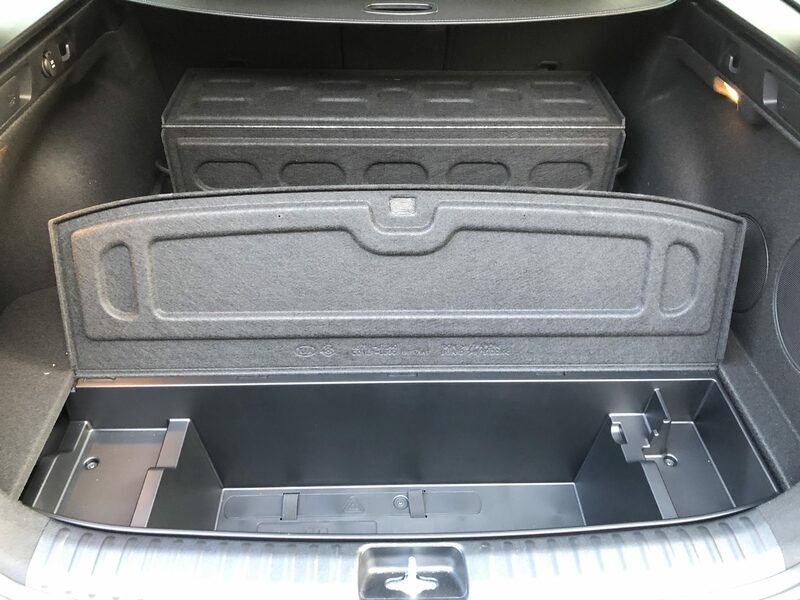 Whilst the interior cabin offers pretty much the same space as the hatch, the hatches 395 litres of space with the seats up & 1,291 litres with the rear seats folded, isn’t anywhere near as good as the SW, which comes with 625 litres & 1,694 respectively. 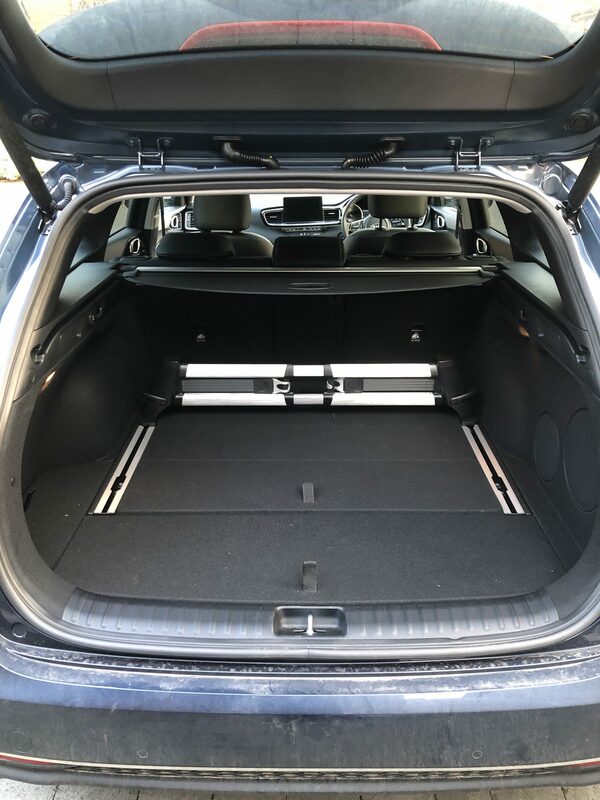 The flat boot floor is also a plus in the SW, there’s no load lip, plus the floor lifts up to reveal two more under floor storage spaces & two smaller ones behind the wheel arches & there’s a luggage rail system that’s fitted as standard to the First Edition. There’s plenty of safety kit. The entry model SW gets Lane Keeping Assist, Forward Collision Warning & optional City Braking. All cars get stability control. ABS, Hill-Start Assist & Tyre Pressure Monitoring. First Edition models add Blind Spot Warning & City Braking, Speed Limit Recognition & Lane Departure Warning, which in common with many cars, was annoying & we turned off. 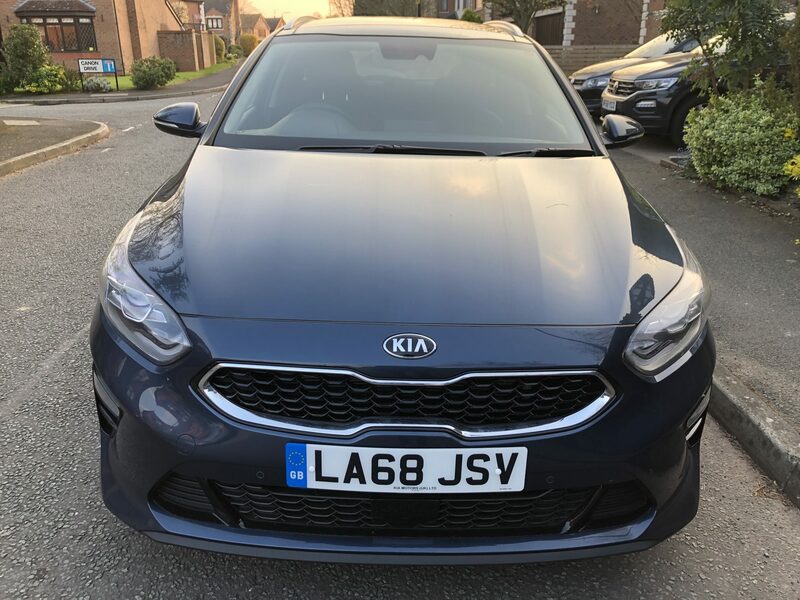 Kia of course also offer an excellent seven year warranty/100,000 miles, with the first three years including unlimited mileage. If you want a small load carrier, then the Ceed SW should be on your list of probables. It’s not the most exciting car to drive & the interior is a little dull, plus it’s not quite up to the Golf or Focus for build quality or desirability. However, it is of course cheaper to buy than the VW or Ford, comes better equipped, with a longer warranty & the added plus of bullet proof Korean reliability. For higher mileage users, we’d pick the diesel over the petrol version every single time.